Melancholy Week | What Smells So Good? Ugh. Who actually likes the last week of August? It's so weird, school starts in a week! I swear only yesterday I was picking up my sister from her last exam and planning my trip down to Niagara Falls! Sigh... where does the time go? Next week will mark a point of substantial change in my life - going back to school for the first time in two years! I'm excited and scared at the same time, though I know I'll be perfectly fine grade-wise (though math class at 6 PM on a Friday?? Ew!) it will be a definite shift. I'm hoping to keep any changes to this blog minimal and I will keep posting as much as I can (quit cooking? Puh-leeeze!) but they probably won't be as frequent or long! Mind you, the more boring a class is the more likely you'll see a long, whiney post (hahaha...). Anyways, enough of that crap. 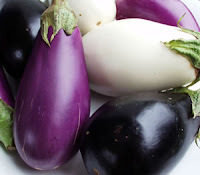 I bought my first eggplant this past weekend, and I have a couple ideas of what I'm going to do with it (it's fairly large and I'll be the only one eating it I believe...) but I actually found this recipe from my mom (another Classic!) so I figured I'd pass it on today. My mom loves to eat ratatouille, and would make this over the Summers when the veggies were perfect and it was too hot for stovetop cooking! I always remember her eating it with rice and a chicken breast (we were a pretty predictable family) but then the next day she'd bring cold leftovers to work. Who knows? If I decide I like the taste (pretty likely, I love zucchini and I hear tell it's similar), you may just be seeing more of it popping up, and then I'll have a great lunch idea for school! Chop and place the vegetables in a large microwaveable covered casserole. Cover the dish and cook on HI for 25 minutes, until soft. Stir in the herbs, pepper flakes (if using) and about 1/3 cup reserved tomato juice. Cook on HI 2-3 minutes. Congrats on the return to school! Once you stop it's hard to get back into it ... so if you're going back, don't quit 'til you're done! I am for-sure going to make this, because I LOVE my microwave.